If you crave Japanese food in Bangkok, there are plenty of places to check out. 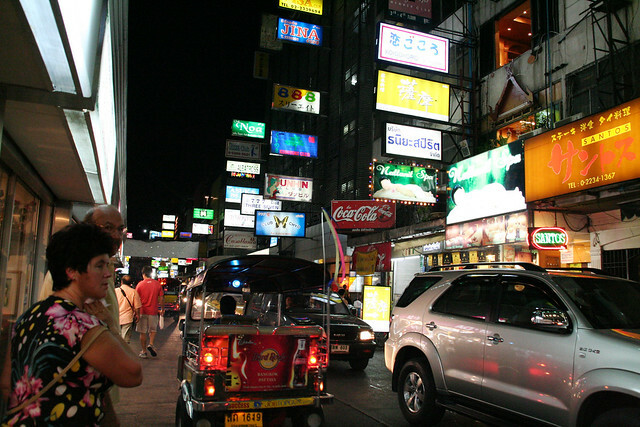 Soi Thaniya in the infamous Patpong district off Silom Road is one of these places where you find lots of Japanese restaurants (and ominous bars) in one small soi. It’s also known as “little Tokyo”, and there’s a small shop with very good sashimi. When you come from Silom Road and walk up, you find it on the right handsite – right next to a Japanese grill restaurant (which is also not too bad and more budget friendly by Japanese standards). Looking at it from the outside: grey granite walls, wooden slide-door, blue curtain in front of it. Forgot the name, but it’s yummy. Next post: Diving in Bangkok?